You may have already been the victim of an unscrupulous real estate broker or loan officer who placed you in a loan that was not right for your financial situation. As a result, your mortgage interest rates may be too high for your budget or may be resetting to a higher rate which will make your monthly payments beyond your budget. Although you may want to refinance or restructure your loan, you may be prohibited from doing so because of a prepayment penalty or an unwilling lender. However, we can negotiate an agreement to modify your loan so you can refinance or obtain a lower interest rate or a reduced principle balance on your home loan. This will serve to keep you in your home. Aside from earnestly trying to reach some sort of agreement with your lender, negotiation may also be a way to buy time and postpone the filing of a notice of default against you. In the meantime you may be able to obtain new financing, or at least scrape together the capital necessary to pay all current costs before the filing of a notice of default. 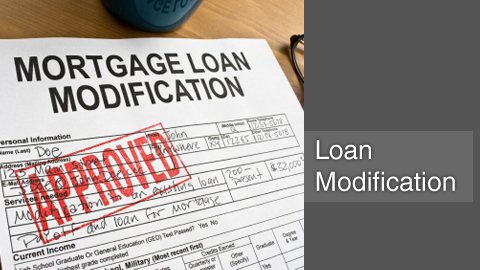 As attorneys, we can negotiate a loan modification with your lender. We will also review all your loan documents to assure that your lender has fully complied with the Truth In Lending Act (TILA) and the Real Estate Settlement Procedures Act (RESPA). If a violation is found, we can take legal action against the lender to stop your foreclosure (if you are in foreclosure) and recover money damages on your behalf. Either way, we will provide you with options and help you navigate through these tough times. We will do everything we can to protect your rights and keep you in your home. To get started with your Loan Modification and for a free and confidential consultation, please contact our office toll free or via email to speak with an attorney.